Find out how to increase your throughput and improve your bottom line using the latest tools in manufacturing automation. A taste of CNC technology will change your manufacturing experience forever! 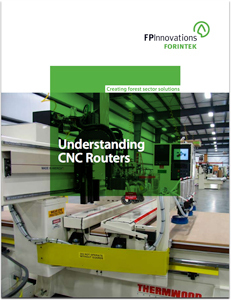 Forintek's new handbook Understanding CNC Routers provides you with an insight on the history of CNC technology as well as with all the information you need about tooling, software, vacuum pumps and the myriad of accessories available to the wood manufacturing industry. Alain Albert directly at 604-222-5613.